Further distancing the company from rumors that its 2014 lineup had been canned, today's third quarter 2012 financial results from THQ list inSANE, Warhammer 40K: Dark Millennium Online, and several more unannounced core titles that should be showing up over the next couple of years. 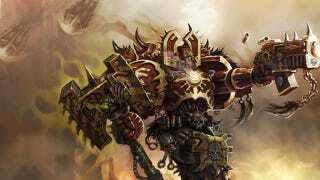 Warhammer 40k fans in particular should be pleased that the upcoming massively-multiplayer game based on the beloved universe is still slated for release somewhere in fiscal year 2014 and beyond. The fate of the MMO project was still up in the air following THQ's assurance that its 2004 lineup was not cancelled. During the fiscal announcement conference call it was revealed that THQ is currently seeking a development partner for the MMO. The report lists four games slated to be released in fiscal year 2013, which begins in April: South Park: The Game, the annual WWE game, Metro: Last Light, and Devil's Third. Titles slated for release in fiscal year 2014 and beyond include an unnamed title from Turtle Rock Studio, Dark Millennium Online, inSANE, Homefront 2, and the unnamed project from former-Ubisoft beard Patrice Désilets. Note that Metro: Last Light has been pushed back from its original summer release. During the conference call it was explained that this was in order to facilitate a strong marketing push, something the original lacked. It's all part of THQ's new plan to deliver strong core titles with aggressive marketing strategies. THQ also indicates that there are four unannounced core titles in development for fiscal year 2014, one of which is likely the long-rumored new Company of Heroes game.